By Scott Gilfoid: Rocky Fielding (27-1, 15 KOs) is looking for an opponent to make his first defense of his newly won WBA ‘regular’ super middleweight title, and James Gale (24-2-1, 14 KOs) would be a great option, according to his trainer Jamie Moore. The 32-year-old DeGale needs a fight after recently vacating his IBF 168 pound title after the International Boxing Federation ordered him to defend against his mandatory challenger Jose Ucategui, who he didn’t wish to fight. At the time, DeGale spoke of wanting to look for bigger fights. It was thought that DeGale would look to face the winner of the George Groves vs. Callum Smith fight. Going after a secondary champion like the 31-year-old Fielding would be a surprise to a lot of boxing fans because it doesn’t make sense for DeGale to have vacated his IBF title in order to take on a fighter like him. That just makes DeGale look like he royally ducked Uzcategui, which you can argue is what he appeared to do. Fielding defeated World Boxing Association World super middleweight champion Tyron Zeuge by a 5th round knockout last month on July 14 at the Baden-Arena oin Offenburg, Germany. Fielding laid low for the first three rounds, and then started to take the fight to the German fighter in the 4th round with his high volume punching. In the 5th round, Fielding continued to unload on Zeuge with nonstop punches until the referee Russell Mora stepped in to stop the contest after the German fighter had been dropped. It was a great fight for Fielding with the way he stayed calm in the first three rounds in taking the best shots from Zeuge. ”It’s really sort of early days negotiating wise, so they are talking about it,” Moore said to skysports.com about a fight between DeGale and Fielding. ”I think it’s a great fight for him. Style-wise it’s a good blend for him,” said Moore. DeGale is looking shot to pieces at this point in his career. Fielding would likely make easy work of DeGale, as would a ton of other fighters in the 168 pound division. Look at how great DeGale made former bottom ranked fringe contender Caleb Truax look in their two fights. It’s not that Truax has improved, because he clearly hasn’t. The only reason the 34-year-old Truax (29-4-2, 18 KOs) looked good is because of how over-the-hill DeGale is now. Truax beat Degale by a 12 round majority decision in their first fight on December 9 last year in London, England. In their rematch, Truax was arguably robbed I losing a 12 round unanimous decision to DeGale on April 7 in Las Vegas, Nevada. Boxing News 24 had Truax winning the fight by a couple of rounds. DeGale looked almost as horrible in the second fight as he did in the first fight with Truax. The only difference is DeGale held nonstop and used a lot of movement when not holding. The referee let DeGale get away with his constant holding without taking points off or disqualifying him. I thought DeGale should have lost at least two points for his holding because it clearly impacted Truax’s ability to throw punches, and it wasn’t the type of holding hat a fighter does when hurt. It was the type of holding a fighter does when he’s gaming the system by preventing his opponent from throwing punches. The referee that worked the fight, Robert Byrd, was very lenient with DeGale by allowing him to hold Truax all night long without stepping in and taking points. “His last few performances haven’t been his best performances, but I think it would be a little bit early to say that he’s over the hill and past it,” Moore said about DeGale. Who is Moore trying to kid? Of course, DeGale is past it. Anyone can see that. All you need to do is look at video of DeGale’s fight against Badou Jack from last year in January 2017 and then watch DeGale’s two fights against Truax. It’s like looking at two completely different fighters. DeGale looks so shot that it’s not even funny. It’s actually quite sad to see how over-the-hill DeGale is now looking. I hate to say it, but Fields, who I see as a largely mediocre fighter, would wipe the deck with the current version of DeGale. Fields would have it incredibly easy smashing DeGale to bits if that fight gets made, which is why I have serious doubts that it will. I mean, it would help DeGale in a huge way to make his fight against the winner of the Groves-Smith fight a bigger match if he does into the fight as the WBA ‘regular’ belt holder after beating Fielding, but I don’t think he can. It would be an incredibly risky fight for DeGale to take in facing Fielding right. Again, I don’t think Fielding is a good fighter. I see him as little more than a paper champion. It doesn’t matter how mediocre Fielding is though, because DeGale is something awful now at this point in his career. The only thing left of DeGale’s boxing skills is his ability to run and hold. Everything else from his game is gone. Moore says that Fielding wants the fight with DeGale, so if he wants the fight too, then it can be made. The big question is does DeGale want to risk his hide in facing Fielding? I think it would have been an easy fight for DeGale if he’d fought Fielding two years ago before his fight against Badou Jack, but it’s a terrible fight for him to take right now. 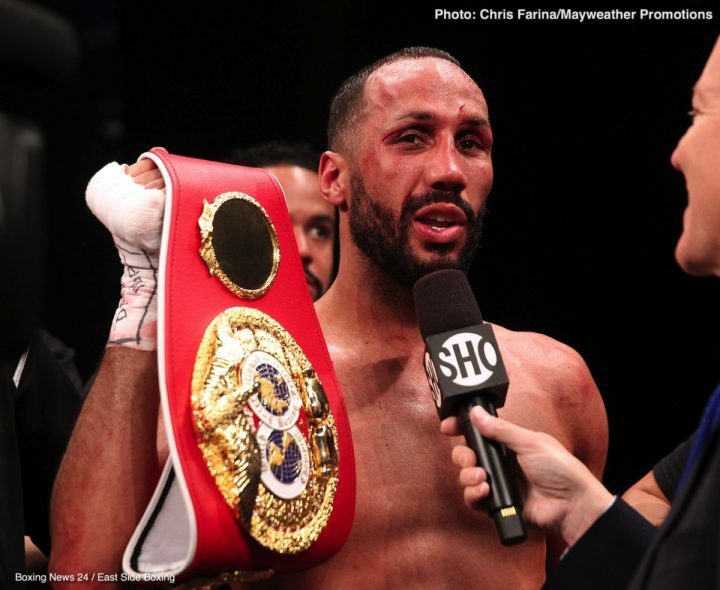 DeGale would be better off staying inactive until the Groves vs. Smith fight is done. DeGale can then cash out against the winner and then retire.